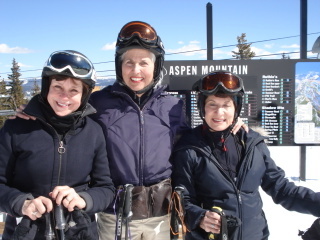 March is the time when all the beautiful people come out of hibernation to hit the slopes in Aspen. The sun has been shining brightly and the average age of skiers on Ajax has increased to about 72. Actually, the mountain is empty, it's Bonnie's and the Sundeck that are packed. At left, Three of the hottest Chix on Stix, Lynda Giles, Carol Kozlow and Doreen Hermelin gettin' ready to go BIG on Ajax. These 2 hot Brazilian girls rode to the top of Aspen Mountain in the Gondola just to brighten up our day. Click on them for a more intimate view.